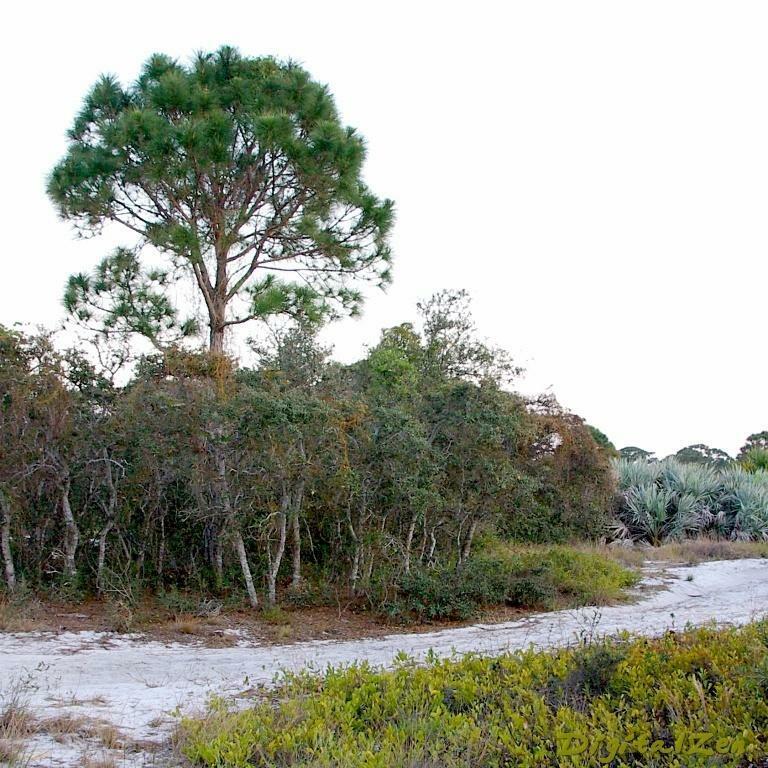 This photo essay is about the coastal scrub of Palm Beach County — specifically, the Hypoluxo Scrub Preserve. However, much of the material here is applicable to other scrub remnants around the state. You can click on the photos for larger images. 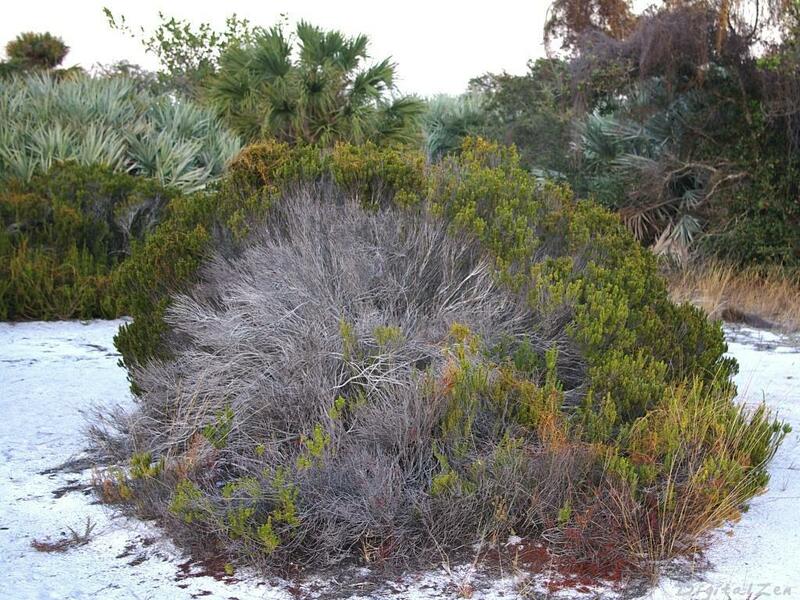 Scrub in Florida is composed of remnants of a huge semi-arid scrub habitat that reached all the way around the Gulf coast to northern Mexico a couple of million years ago. The contiguity of the habitat has long since been interrupted by rising sea levels that produced, among other things, the bayou country. What remains are islands of similar plants and animals that have been separated from their brethren for a long time. The independent changes that have occurred in the fragmented plant and animal species are of tremendous interest to biologists and zoologists, and the information they have gained about mutations and short-term evolutionary changes could (and does) fill numerous books. 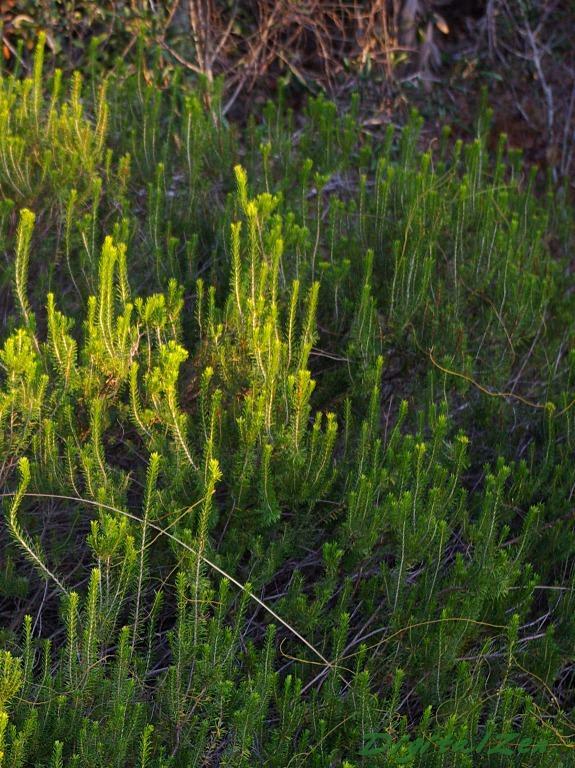 The scrub is home to more rare and endangered plants and animals in one area than anywhere else in the continental US. 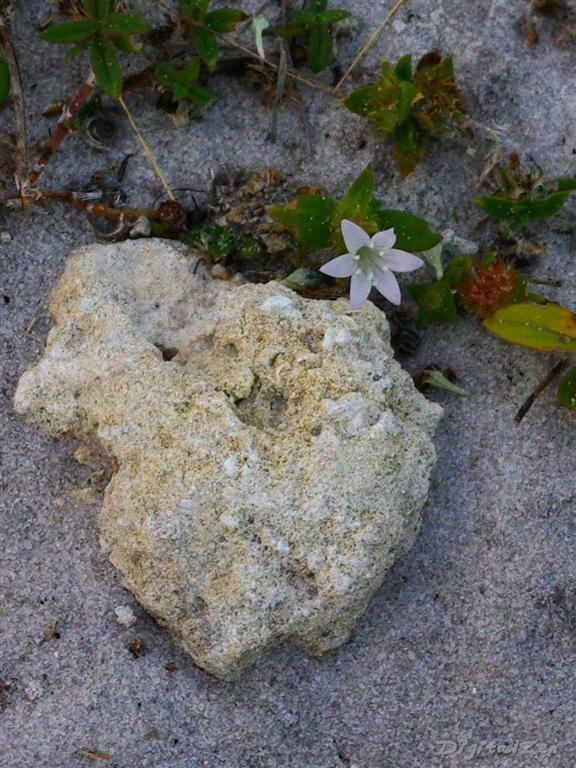 These include tortoises, lizards and — among the plants — the only known flowering plant in the world that spends its entire life underground, facilitated by the translucent quartz sand that allows light to penetrate the few centimeters to where the plant lives. 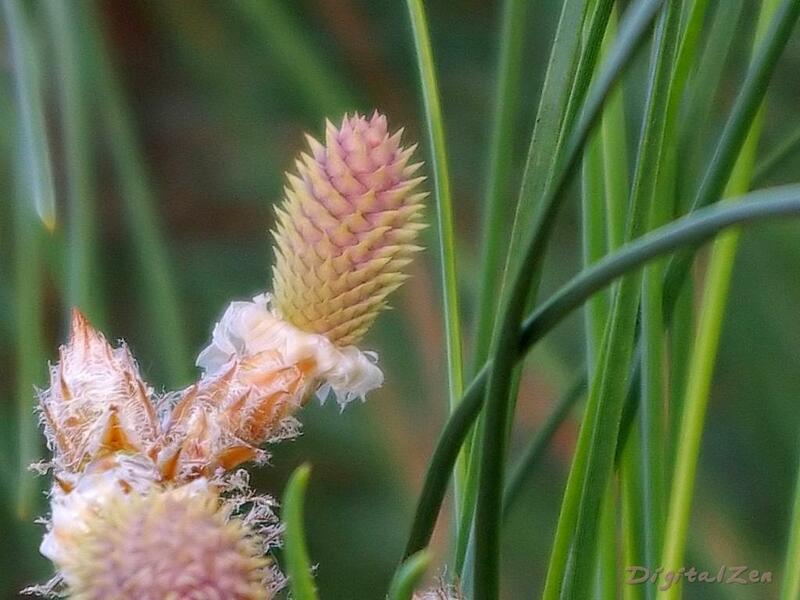 Only the blossom of the tiny plant protrudes above the surface for a short time each year to allow pollination. 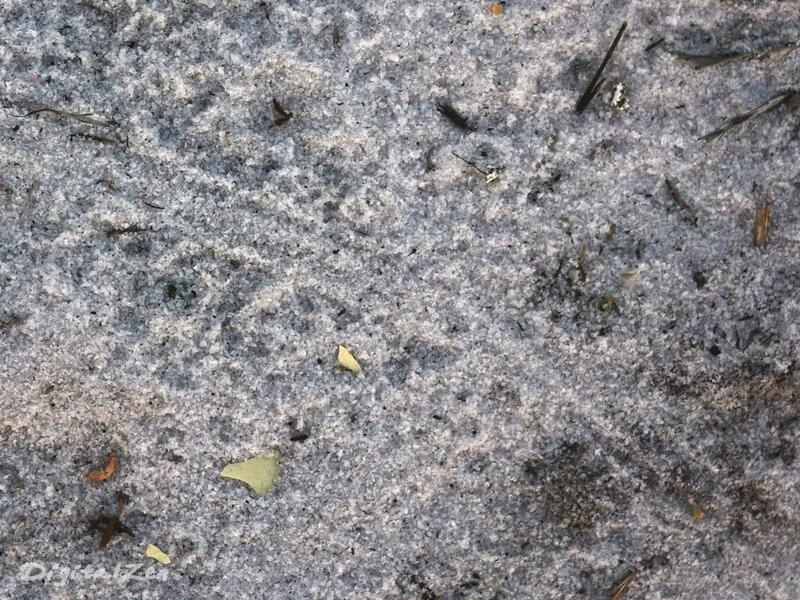 A Millipede’s track and raindrops mark the quartz sand that makes up the fossil sand dunes of the Florida scrub. Washed down from the eroding Appalachians a couple of million years ago, these “sandhills” make up much of the topsoil in the higher elevations of the peninsula. As in all of the world’s arid regions, whether the Sahara, Tibetan Plateau or Antarctica, plants in the scrub grow slowly, and are relatively delicate in terms of having their lives disturbed. Tire tracks through the scrub will alter the microclimate around them by collecting rain that would normally sink in and nourish nearby grasses. Since there is little decaying matter to create soil and fill them in, the tracks and bordering bare areas may be visible for decades. A well-meant sentiment, but a no-no in the scrub. Even tiny disturbances such as these put stress on the surrounding soil and native plants. 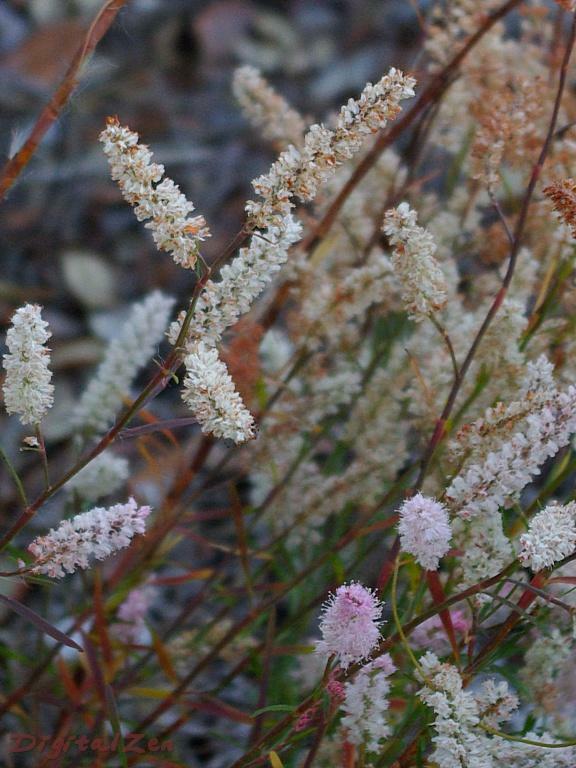 Here are some examples of the delicate species that make the scrub home. 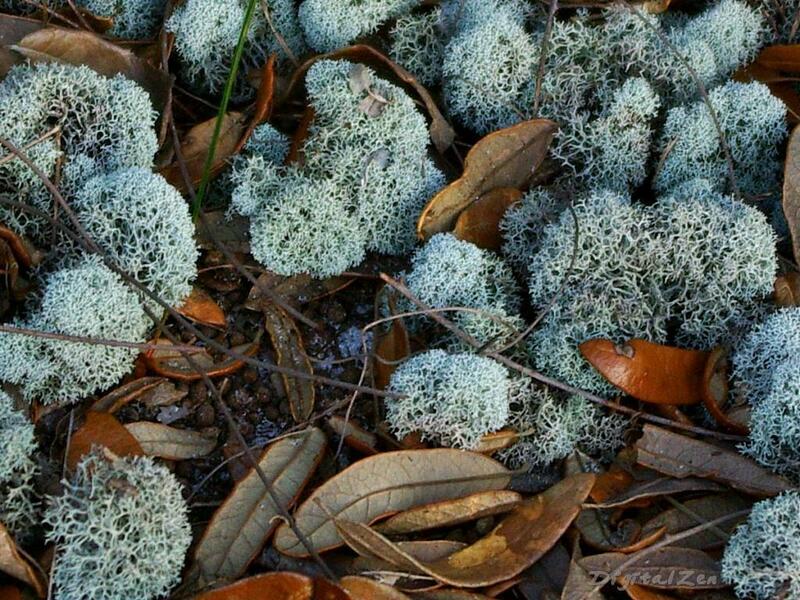 These lichens, known collectively as Reindeer Moss, are a symbiotic association of fungus and algae. The fungus breaks down the meager nutrients available, and the algae create food for all parties through photosynthesis (not a fungal attribute). 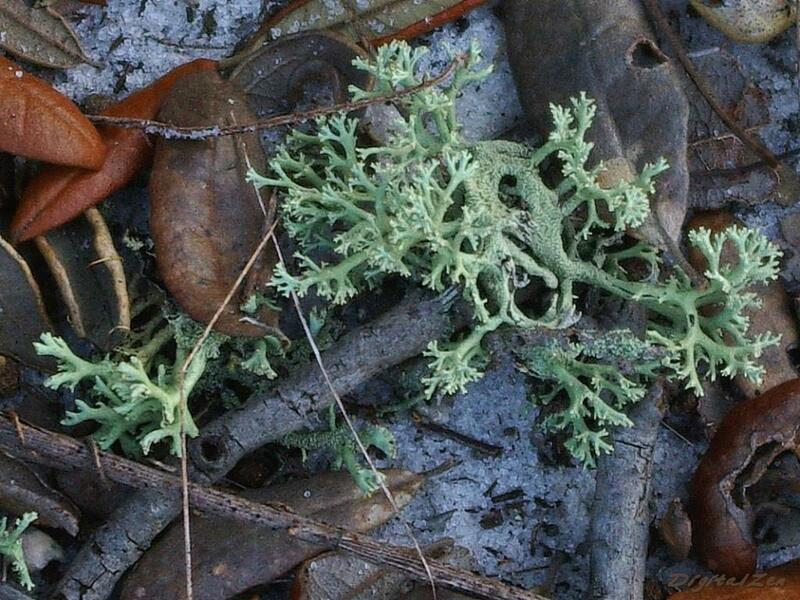 Because of the low nutrient levels, lichens of this kind grow extremely slowly. Some of those pictured could be several decades, even a century old. A careless foot can do away with those long years of growth. A common form of scrub lichen. These used to be popular as decorative garnishes to pots of flowers and other displays, but fortunately have fallen out of favor. The individual puffs range from a quarter-inch to three inches. I have seen some in undisturbed areas as much as a foot across. Those must have been centuries old. A rather less-common Staghorn lichen (what else would they call it?). You can tell from the Scrub Live Oak leaves about how big these bad boys are. Another teeny-tiny resident. Check out the sand grains for a size reference. The piece of limestone with shell fossils could have been deposited with the sand, but was more likely an import by humans. 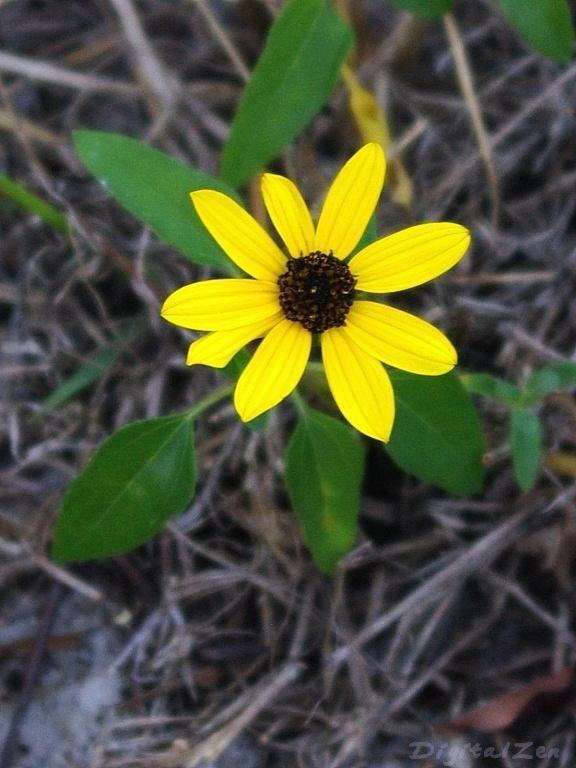 These little flowers are newcomers on the Florida scene, and they really like dry areas like roadsides and scrub. I’ve been trying to find out what they are, with no results so far. I have to go check it out at the Dept. of Agriculture. Pretty little things, but all exotics are potential disasters, for they lack natural checks and balances. 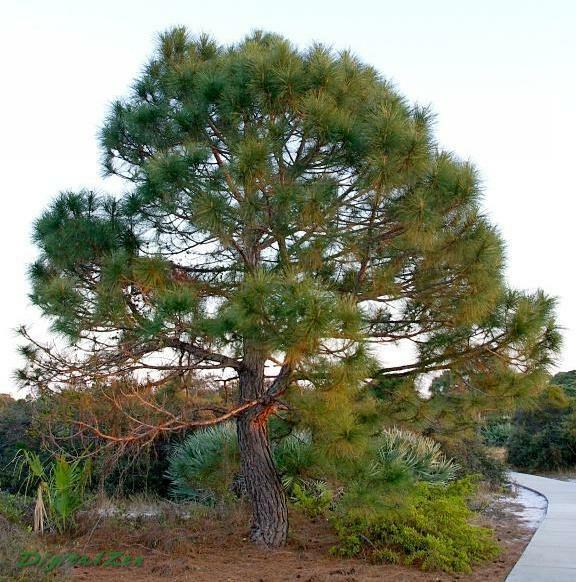 A Slash Pine towers above a grove of Scrub Live Oak or Sand Oak (Quercus geminata). 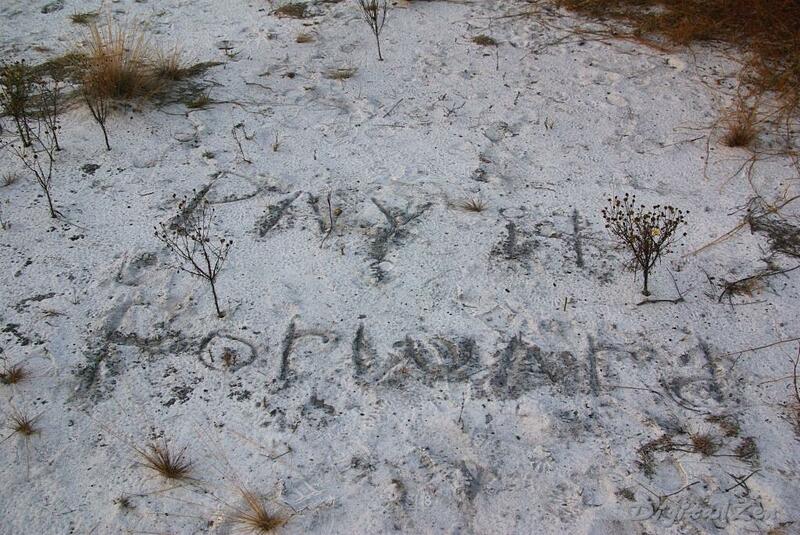 Like many plants in arid habitats, these little trees don’t get very big, but they do get old — some well into multiple centuries. 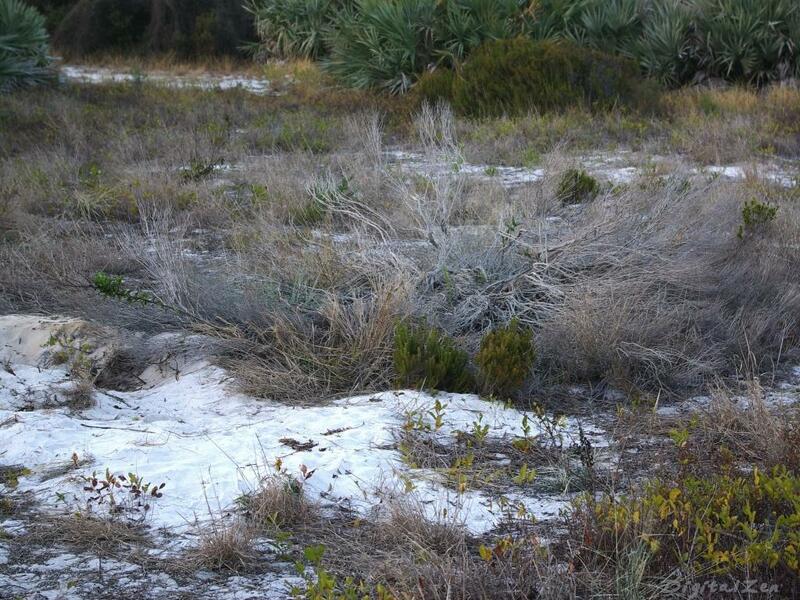 To the right, you can see a stand of Silver Palmetto, a low-growing palm that is fairly common in coastal scrub. Another view of a Scrub Oak. this one, from the Seacrest Scrub in Boynton Beach, FL, shows the grotesque shapes for which the species is famous. The trees in the previous photo, growing close together in their little grove, have all shot straight upward looking for sunlight. This one had room to branch out to the sides. 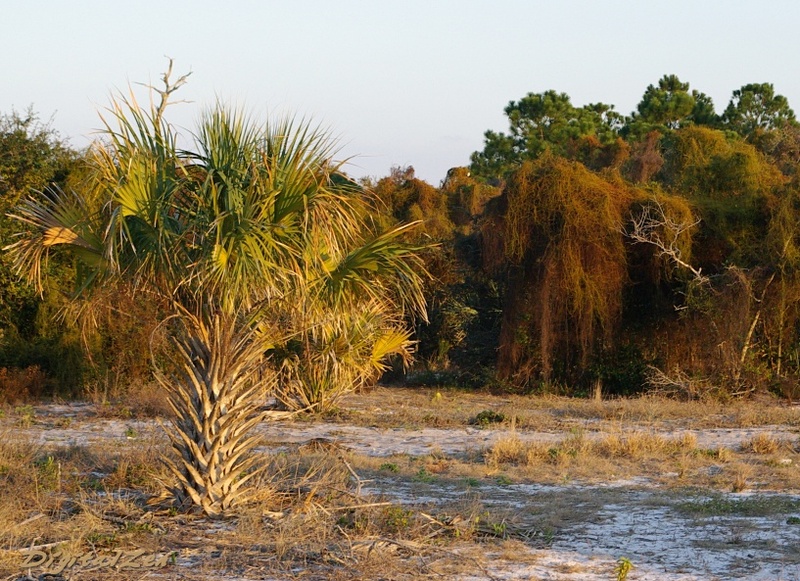 A dwarf Cabbage Palm (Sabal palmetto), the state tree of Florida and South Carolina. This one’s growth has been constrained by the arid conditions. To the right rear you can see Scrub oaks covered with Love Vine (Cassytha filiformis), a native plant that forms dense mats over trees and bushes. It is especially fond of oaks. Apart from killing off some of the branches, it seems to do no real harm. 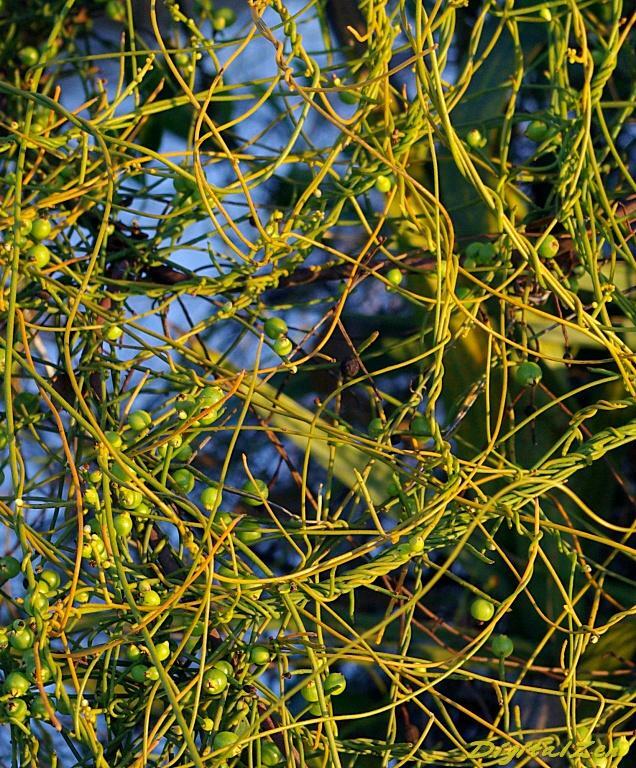 Love Vine, up close and personal. Sorta gives “tangled” a whole new dimension, doesn’t it? Another common vine, the Cat Briar or Greenbriar (Smilax sp.) is the bane of anyone who has tried to navigate through a dense temperate woodland. Like so many things, however, a close look reveals amazing beauty in some very odd places, as you can see below. 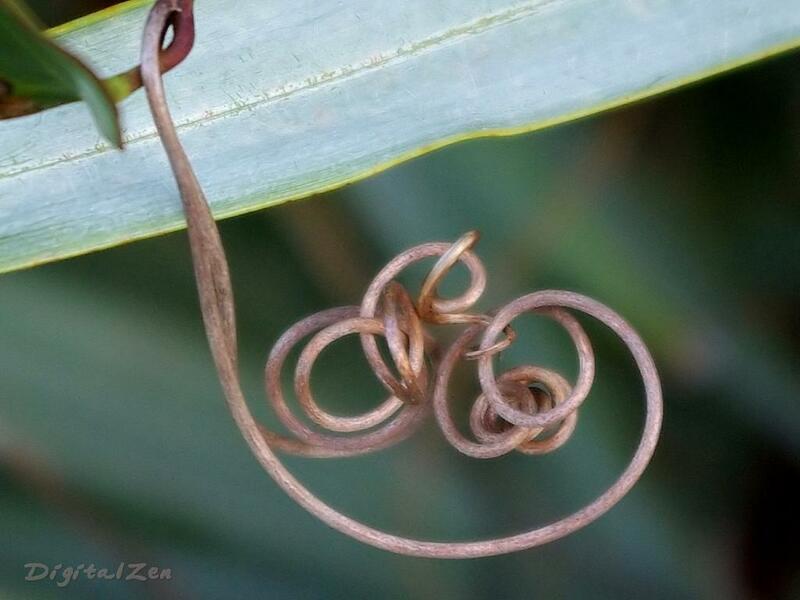 Cat Briar tendril and palmetto leaf. 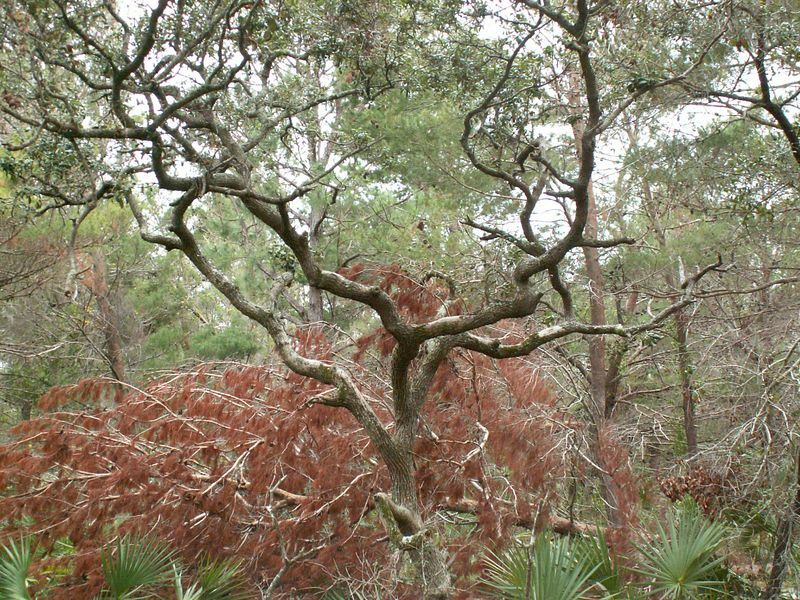 Florida Slash Pines normally grow to heights of 40 – 60 feet, with long, tapering trunks (think telephone poles, which used to be one of their primary uses). This one, however, grew up in the scrub and has turned into a sort of big bonsai due to the lack of nutrients in the soil and low moisture levels. The trunk has a pronounced taper, and the entire tree is about 15 feet tall. Note also the bushy look, characteristic of trees that grow in the open where they do not have to compete for sunlight. 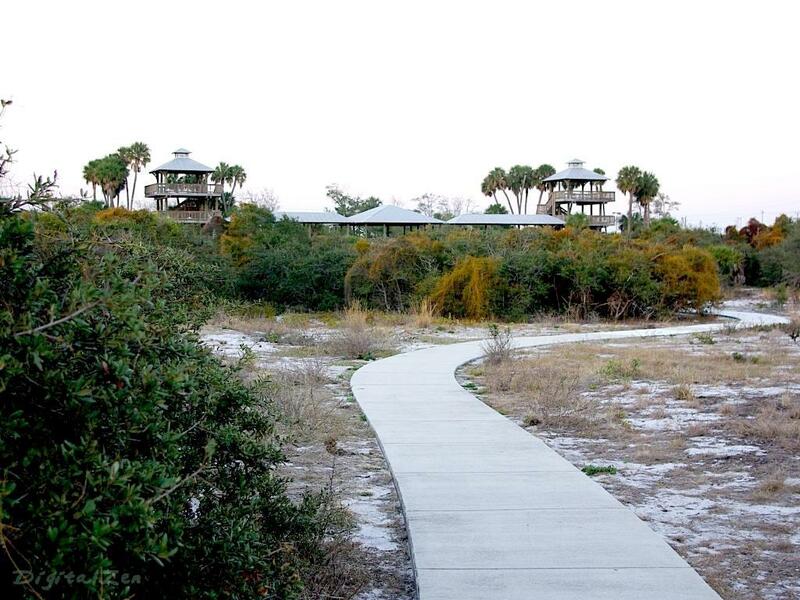 The sidewalk to the right of the tree has been built to encourage walkers to remain off the fragile scrub habitat. A baby pine cone on the same tree demonstrates, once again, the beauty in the details. Another clump of totally devastated Rosemary. The Gopher Tortoise next door moved out when he lost his roof. Because of its stable substrate and good drainage, scrub land is popular for development, and turtles get in the way of progress. 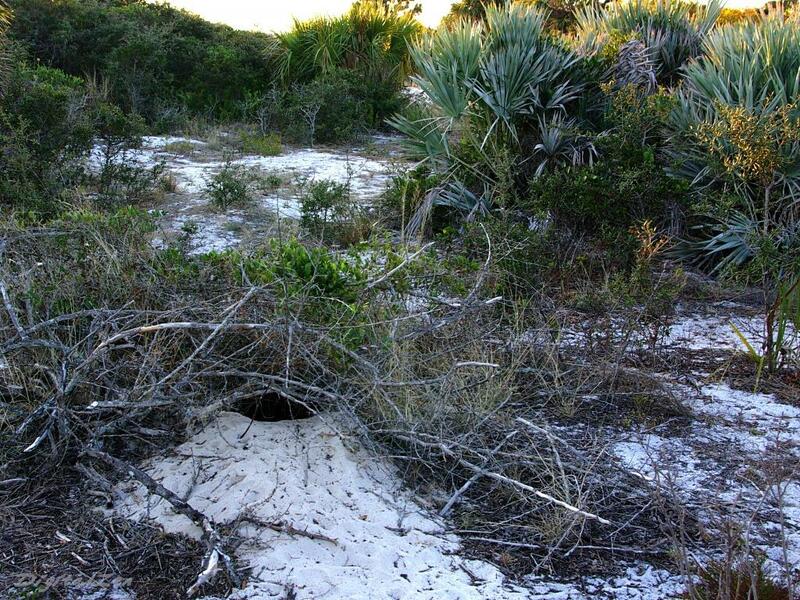 There are a number of Gopher Tortoises at Hypoluxo Scrub, brought in from other locations less well-protected. They venture out from their burrows to nibble tender shoots, and unerringly find their way home again. As you might expect, this makes them difficult to relocate, and the entire preserve has to be fenced. 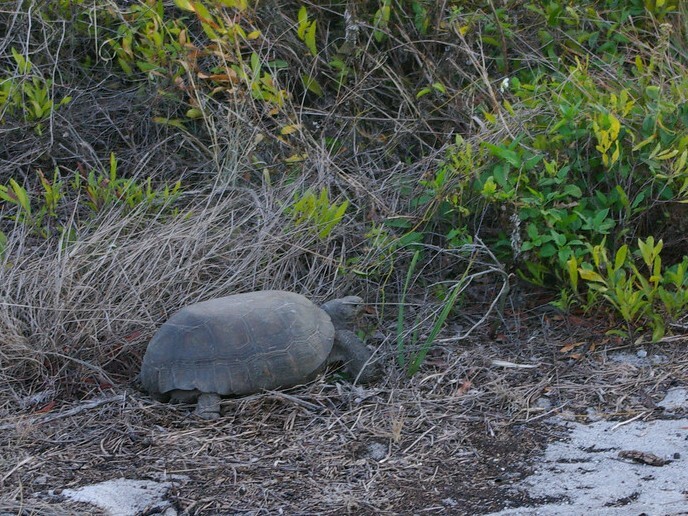 Florida Gopher Tortoise (Gopherus polyphemus) at work. Poor little guy looks like he was designed by a committee of Army guys, doesn’t he? Smartweed (Polygonum sp.) There are more than thirty subspecies of Smartweed in North America. It is a member of the Buckwheat family. Beach sunflower (Helianthus sp.) These guys don’t especially prefer scrub, they just like dry, sandy places. Dunes of any kind make them happy, fossil or living. 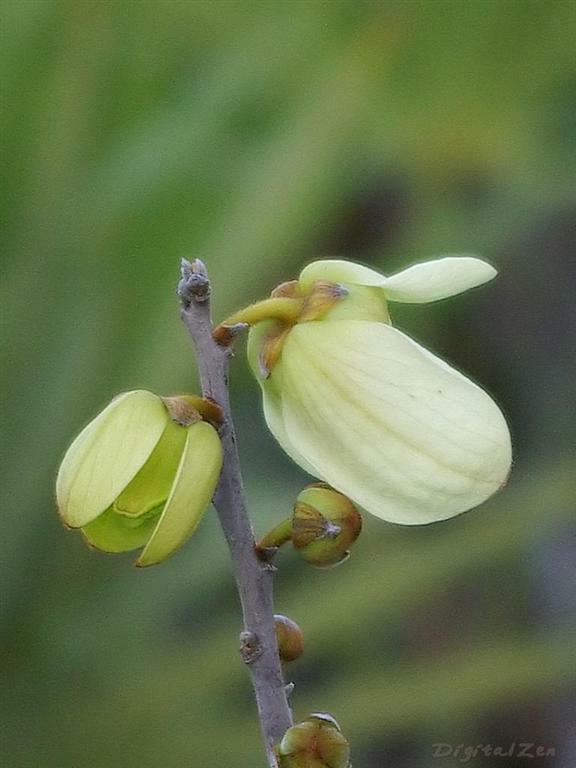 The Scrub Pawpaw (Asimina obovata) is restricted to scrubs in central and coastal peninsular Florida. It re-sprouts after fire and reaches up to 10′ in height. The beautiful, fragrant flowers are up to 4″ across. They are followed by sweet, banana-like fruits about 3″ long that are relished by wildlife. Finding a ripe Pawpaw on the tree is nearly impossible. They must be picked when green and ripened at home. (Scrub Pawpaws, however, are strictly protected.) The foliage of all pawpaws is malodorous and this one is no exception. Cattle leave it alone, and often the only plants above ground level in a pasture are the pawpaws. A Prickly Pear’s needle-like thorns are between 1″ and 3″ long, depending on the species. The thorns have microscopic barbs, guaranteeing that they will not be removed easily. At the base of the thorns, to add insult to injury, are more tiny hairlike thorns that are hard even to see, let alone remove. The lobes (leaf-looking thingies) are loosely attached, and when one thorn nails you the lobe detaches and several more thorns pierce the offending limb or other body part. Prickly Pears have delicious fruit, but it takes a true connoisseur to gather them. Less dedicated tasters buy them in Hispanic markets — the sissies. 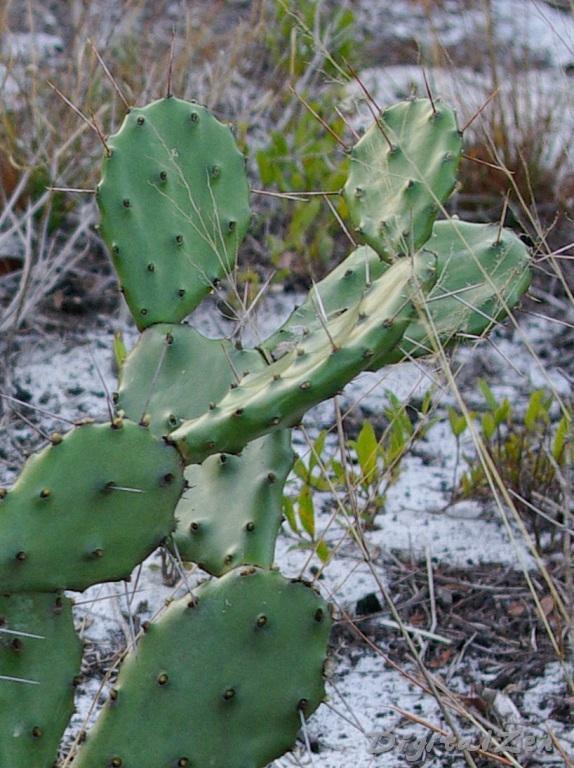 Prickly Pears are found all over the world, but in Florida they mostly stick to scrub and beach dunes. PS: If you think it’s hard to find all these cool things, I took all but three of these photos (along with about 80 more) during a 40-minute sunset walk. Enjoy! All photographs by the author. Except for the photograph from the Seacrest Scrub, all were taken with a Pentax K10D digital SLR camera and Pentax SMCP-DA 16-45mm f/4.0 ED AL Autofocus Lens in programmed exposure mode. Editing and re-sizing with FastStone Image Viewer and Photoshop Elements 5. Bill, there is one picture where you didn’t know what the flower was. Let me know and I will send a link to it to a biology professor here who studied at UF in Gainesville and knows the area. He probably knows what it is. Your friend may not have run across them in person. They have cropped up in mostly ruderal areas and roadsides since the ’80’s, roughly. I’m pretty sure they’re exotics, but he would certainly be able to find them in a reference. I forgot all about researching it further. As I’ve gotten older, I’ve lost the compulsion to know the names of everything and how they fit in to everything else. Now I just try to enjoy them. Great photos. We have almost all of these plants on our property in Clay County, Florida. Thanks for the info on the lichens. I will certainly go out of my way to not disturb them now as they may be as old as we are. Pretty neat!